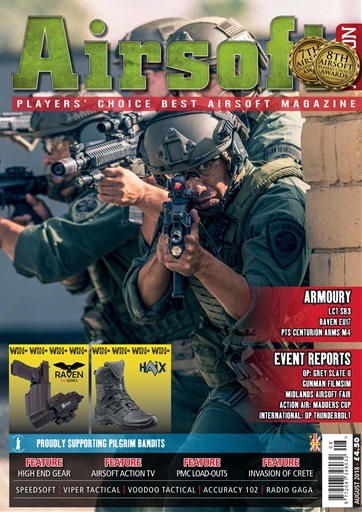 At Airsoft Action we constantly strive to bring you the widest coverage and this issue is no exception, as we look at three very different guns, including the new PTS Centurion Arms M4, LCT's superb SR-3M "Vikhr" and Raven Airsoft's latest pistol offering, the EU17. Out and about, in "Hulmutt Province" we take part in the latest Gunman FilmSim, we go shopping at The Midlands Airsoft Fair, fight the rain at "Grey Slate II" and report from the 4th "Madders Cup" Action Air match. We also talk to the guys behind "Operation Thunderbolt" in Brazil, where local "challenges" almost wrecked the event and get the low-down on the UK's Direwolf Airsoft team. Gear is a vital part of airsoft and Gadge, Bill, Andy, Frenchie and Kelly all take a look at different aspects of what we wear in-game. This has been a big month for Airsoft Action as Gadge and Tom launched Airsoft Action TV on YouTube, a weekly channel bringing you live action reports, in-field testing and extended reviews, plus exclusive competitions and content from some of airsoft's biggest names. 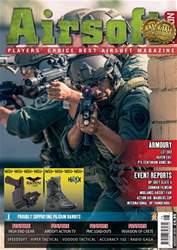 ...and to top it all off, in this issue you could WIN ONE OF FOUR RAVEN EU PISTOLS and A PAIR OF HAIX BLACK EAGLE TACTICAL boots simply by answering a few easy questions! 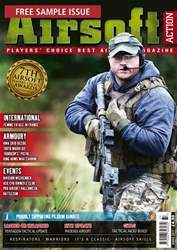 We hope you enjoy Issue 90 of Airsoft Action - voted The Best Airsoft Magazine by airsoft players.